In Canada, we’re so glad to live in a world where there are Octobers (at least Canadian author L.M Montgomery thought this was the case). The enchanting dapples of red and golden light under beech, birch, maple and poplar trees make Fall a magical time to visit Canada. The air is getting just a little cooler the nights more crisp. This transitional time is just right, the summer crowds are ebbing away and you get to catch Canada in its finest golden hours. It’s a cozy and romantic time for a visit to Quebec City. Let the red and orange leaves fall around you as you stroll cobblestone streets and bask in its old-world European charm. We think an amazing blaze of autumn colour is the perfect companion on an iconic train journey in the Rockies or across Canada. We’ll help you select the right route for you. 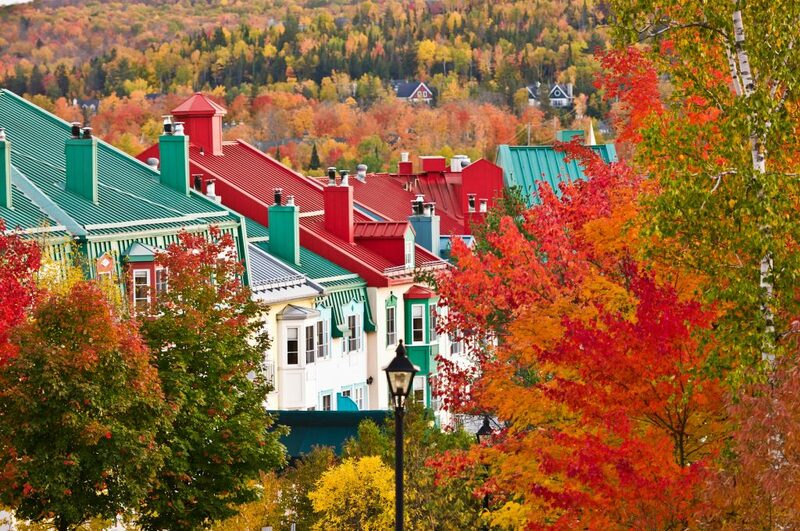 Fall is a perfect time to travel to Canada. Summer crowds fall away and the change of the seasons will be upon you with the turning of the leaves and a breeze in the air. Share new memories of your nights in the charming inns across Nova Scotia, ride the rails through the Rockies or take a relaxing road trip through the charming villages of rural Quebec.